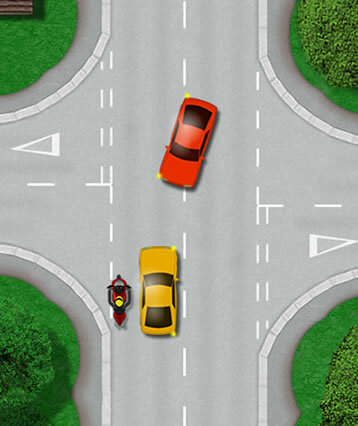 Riding a motorcycle in towns and cities does come with advantages particularly during periods of traffic congestion. Filtering allows a rider to pass slow moving traffic in order to make progress. Traffic filtering requires a high level of skill. You’ll need to anticipate the actions of other road users, have an astute awareness of your surroundings, to make accurate decisions quickly and do all of this whilst remaining within the law. Overtaking on the left, or ‘undertaking’ as some may refer to it, may appear as a brief manoeuvre to make progress, though a lack of appropriate judgement may see a rider facing penalty points and a fine. Though there are no specific laws that make overtaking on the left illegal, depending on the severity, it may result in a fine, penalty points, the penalty of reckless or dangerous driving, a driving ban and potentially even a custodial sentence. It would need to be quite extreme for the latter to happen – though if your actions resulted in an accident then it’s perfectly plausible. the vehicle in front is signalling to turn right and you can safely pass on the left. Be cautious if there’s a road to your left (it’s a crossroads for example); an oncoming vehicle may turn right, into the road that you are passing on your left. The vehicle turning may be hidden by the vehicle that you are passing. you’re in lanes and slow moving traffic in the lane to your right is moving more slowly than you are. This is a typical situation during busy periods on motorways, dual carriageways and multi-lane traffic systems in cities. you are riding on a one-way street where vehicles can pass either side. This does not include a dual carriageway. you are at a junction in your own lane for turning left.